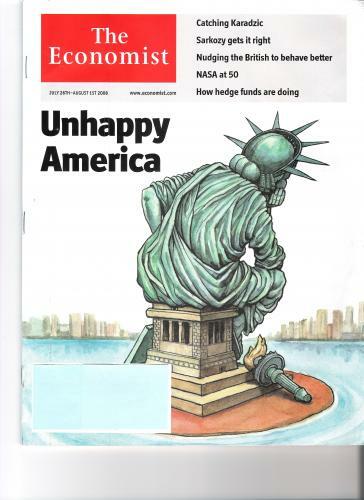 The cover of this week's The Economist magazine reads "Unhappy America". To the authors' credit the article goes beyond the typical Bush-bashing and identifies several factors at play. They were treading down the right path when they observe that "Lax monetary policy allowed Americans to build up debts and fuelled a housing bubble that had to burst eventually." But rather than going into further detail in addressing the subject of easy money, the chief culprit of the financial mess we will be in for years, the authors turn their sights on the need for education, healthcare, and other reforms. The authors exercised relative restraint in assessing America's lurch away from free-market capitalism in the wake of the housing market bailout, the Fannie (NYSE: FNM ) and Freddie (NYSE: FRE ) backstop, the special protected status 17 financial companies are receiving against naked short sales, etc. Since World War II, the United States has been the center of global finance, and it has used that position to virtually dictate the conditions under which many other nations - particularly developing countries - can get access to capital. Letting weak companies fail has been high on the list. Paulson, who announced the bailout, made his name as chief executive of Goldman Sachs, the Wall Street investment giant, where he pried open new markets to foreign investment. As Treasury secretary, he has served as chief proselytizer for American-style capitalism, counseling the tough love of laissez-faire. In particular, he has leaned on China to let the value of its currency float freely, and has criticized its banks for shoveling money to companies favored by the Communist Party in order to limit joblessness and social instability. All through Japan's lost decade of the 1990s and afterward, American officials chided Tokyo for its unwillingness to let the forces of creative destruction take down the country's bloated banks and the zombie companies they nurtured. The best way out of stagnation, Americans counseled, was to let weak companies die, freeing up capital for a new crop of leaner entrants. But I don't think Americans much care about the "sorry state of capitalism". For Americans, it is more about the ends "lifestyle" than it is about the means "economics" or how to best achieve it. In a commentary I wrote a few months ago I referred to "borrowed consumption" becoming the new "opium of the masses." As incomes and savings peaked in the 1970s Americans increasingly became dependant on rising asset prices and increased debt to further fuel their ever-growing consumption habits. As a result, consumption rose from being 60% of the economy to over 70% today. Incidentally, the current recession is consumer-led and will therefore be much larger than the business-led recession experienced earlier in the decade. Savings has also dropped from 8% to zero (or negative, depending on how you measure). Other countries have been complicit in this unsustainable economic scheme by agreeing to buy US debt, thus underpinning the US currency, keeping US interest rate low, and allowing their own economies to grow through production and exports. But this relationship is reversing (or at the very least has stalled) and Americans who have been living "la vita leveraged" and just beginning to enter a painful period of a decreasing asset prices, higher costs of credit, and higher costs for essential goods. For decades, America 's shift from thrift could be summed up in this familiar phrase: When the going gets tough, the tough go shopping. Whether for a car, home, vacation or college degree, the nation's lenders stood ready to assist. Companies offered first and second mortgages and home equity lines, marketed credit cards for teenagers and helped college students to amass upward of $100,000 in debt by graduation. Every age group up to the elderly was the target of sophisticated ad campaigns and direct mail programs. "Live Richly" was a Citibank message. "Life Takes Visa," proclaims the nation's largest credit card issuer. Eliminating negative feelings about indebtedness was the idea behind MasterCard's "Priceless" campaign, the work of McCann-Erickson Worldwide Advertising, which came out in 1997. "One of the tricks in the credit card business is that people have an inherent guilt with spending," Jonathan B. Cranin, executive vice president and deputy creative director at the agency, said when the commercials began. "What you want is to have people feel good about their purchases." The consumption binge is over. The great unwind of debt and leverage for most has started. The Economist magazine reveals that shrinking percentage of Americans are benefitting from income gains. They attribute it to those who can benefit from the gains in technology and globalization, but I attribute it to the money shufflers who are the one of the only remaining contingents who are able to benefit from loose money and higher non-asset inflation (i.e. inflation in commodities). The last pillar for most was the removal of asset inflation and the development of rising inflation for goods and services in the economy. Now tack on their level of indebtedness and you have an economic disaster looming on the horizon. Virtuous cycles have turned vicious. When you consider the years and years this has been building, you should be scared out of your wits about the unwind. A Gallup poll finds that 80% of Americans, when responding to the question, "How do you feel about the way things are going in America ?" say they are dissatisfied, up from 30% in 2000. Ironically, baby-boomers are the gloomiest. They should be the happiest. They are the ones who most benefitted from this debt and asset-induced consumption gorge over the last three decades. But perhaps it is because their generation has become the most reliant on material goods for their satisfaction that they feel they have the most to lose. This is what a hangover feels like. We are getting what we deserve for the most part. Most of us enjoyed immense material benefit from the illusory wealth that was created during this period. Those of us who were fortunate enough to pay off our debts should consider ourselves lucky. Those of us who have not are going to struggle. Those of us who have lived austere, responsible lifestyles based upon thrift and savings will be relied upon to bailout those of us who have not. John Waggoner of USA Today writes in an article titled "Consumers Fall Further Behind, Financially" that "Consumers are behind schedule in payments or have walked away from nearly $800 billion in household debt of all kinds - mortgages, credit cards, car loans, says Mark Zandi, chief economist for economy.com. ‘Household credit quality has arguably never been worse,' he says." In normal cycles the cost of credit would be going down to help cushion the blow, but as Pimco's Bill Gross perceptively points out in his August "Investment Outlook", "But the cost of credit is going up not down in contrast to prior cycles, because astute investors recognize the myriad of global imbalances that threaten future stability. The co-CIO/CEO of Pimco, Mohamed El-Erian quoted in "Blowing in the Wind: America braces itself for the risk of a second dip," an article appearing in the Financial Times , written by Krishna Guha, says "there may be ‘multiple unstable equilibria' for house prices, the financial sector and the economy." I think by "astute investors" Gross is referring to those who do not listen to the gurus on financial TV endlessly predicting bottoms which never seem to occur and who tell you not to buy gold. The "Blowing in the Wind..." article warns that the fading effects of the stimulus checks and the fact that "The time lag between the credit crisis in the financial sector and the peak of the credit squeeze in the real economy may simply be longer than initially anticipated" could result in the dreaded double dip recession. I agree with the author when he finds, "At the core of the threat to growth is the resumption of the basic dynamic of the credit crisis: a negative feedback loop from a damaged financial sector to the real economy and back again. This is aggravated by a decline in house and stock prices that reduces collateral available to support loans." Many others are beginning to speak more loudly about the negative feedback loops. Do you not see how this is turning into a vicious cycle?" The tipping point has been reached. The biggest consumption party in the history of the world is now over and the hangover will be felt for years to come.